Finished. This quilt, I mean. 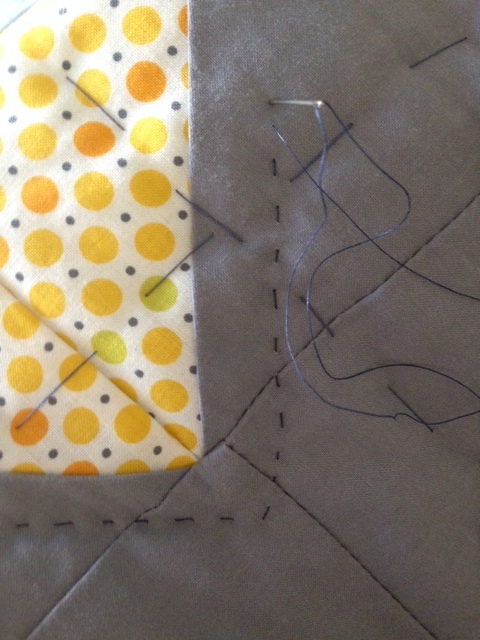 Ten hours of British television later (All Creatures Great & Small and new fave, Midsomer Murders), I’ve completed the hand-quilting, which means its now a quilt that’s ready for loving and living. 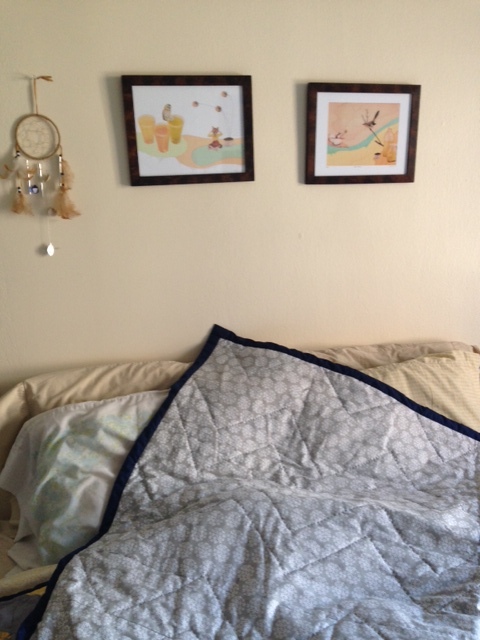 I picked the fabric out for this quilt in New Hampshire, and cut fabric in Maine. 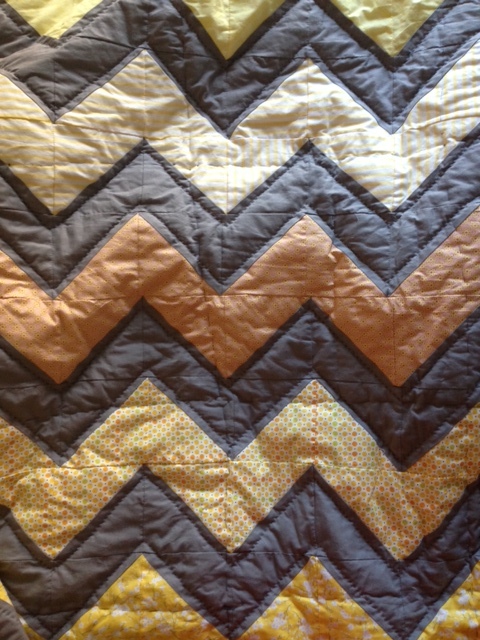 Together with my sister and my mom, we assembled this chevron quilt in Cape Cod over a very productive and warm spring weekend. 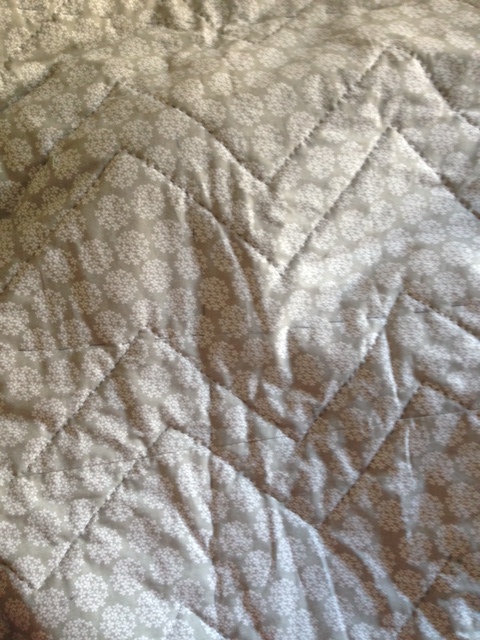 This quilt got my sister into the quilting game; she learned to cut, arrange, and sew the triangles, and I *think* she thought it was actually quite fun. 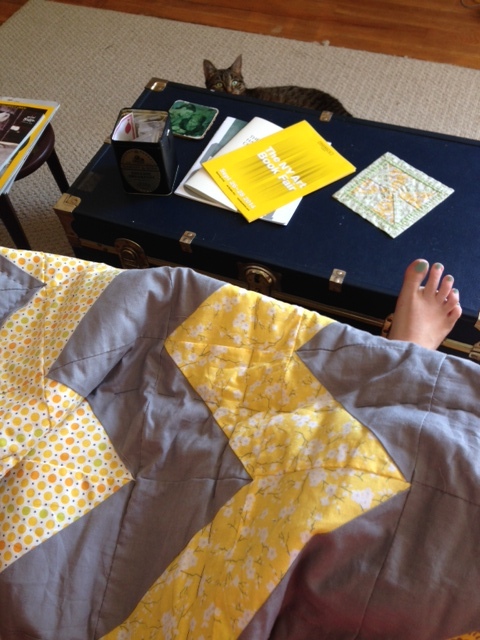 The lucky person to get this quilt will have the one quilt (so far!) that my mom, my sister, and I have all made together. So, next weekend, I’ll be shipping this quilt off to its new home where it can be used for picnics and late-night movie marathons and rainy day reading days. And it’s on to the next one! I’ll be finishing that quirky little, sister star quilt over the next few months. In other news, it’s beautiful here this weekend. Indian summer kind of weather. Besides quilting, job applications and grocery shopping, I went to the NY Art Book Festival yesterday at M.O.M.A. PS1 in Long Island City. (This event should be renamed: 1000 Beautiful People Festival.) Then bf and I had a whiskey night at one of my favorite Astoria bars, Sweet Afton. 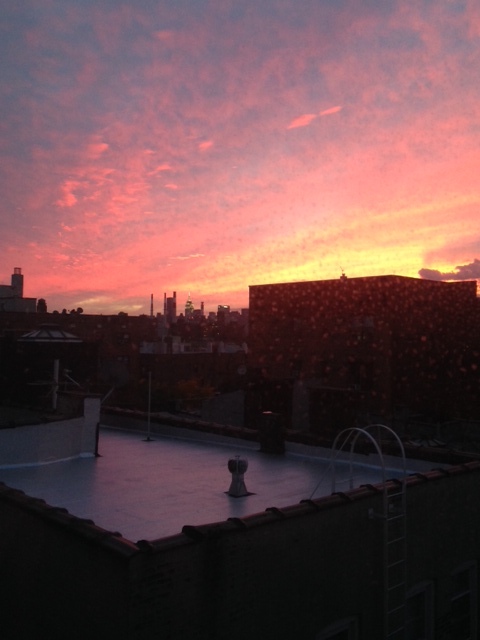 After surviving an incredibly lonely summer in NYC, I’m finally beginning to feel more centered here. For months, I suffered, thinking that moving here was a huge mistake, that I had ruined everything I was building back in the Seacoast. Financially-speaking, this move has certainly pummeled me, and I’m really hoping to rectify that ASAP. But everything else-wise, I’m now restructuring this move as a sort of artist residency; a chance to be away from my comfort zone in order to create some great work. And speaking of great work, I actually made up a recipe for a brunch & lunch salad yesterday. The only other salad recipe I’ve ever created was way back when I was 8, and the salad consisted of iceberg lettuce, raisins, apples and mayonnaise. While this salad was created of all refrigerator leftovers, I’d like to think that it has a bit more class than my mayo salad. Unfortunately, I didn’t take any pictures of this brunch & lunch creation. The bf & I scarfed it as soon as it was complete. You’ll just have to make it yourself to see how beautiful it is. In a large frying pan, heat the olive oil over medium heat. Add the cauliflower, onion, chickpeas and thyme. Season with salt & pepper. Cook about 5 – 7 minutes on medium-low until the onion softens and the chickpeas and cauliflower begin to brown. Add the garlic, stirring until fragrant (about 1 minute). Remove from heat. Let this mixture cool in pan for 3 -5 minutes. In a large-ish bowl, add the spinach, feta, and crumbled bacon. Once cooled (but not cold), add the cauliflower & chickpea mixture. Add most of the mustard dressing (see dressing recipe & ingredients below), saving some dressing to drizzle over your eggs. From here, you can either mix together with your cool salad spoons OR you can do as I do = put a large plate over the top of the bowl, pick up and shake around like a mad woman. Ladle salad into low, wide bowls or small-ish plates. Now onto your eggs. I am a new huge fan of eggs overeasy, with yolks that are soft and slightly runny. You could also do poached eggs for this or hard-boiled even. The choice is yours! I like 2 eggs always for things like this, but 1 egg per serving will suffice, if that’s how you roll. To make my new favorite kind of overeasy eggs: Heat up your frying pan again over medium heat, melting the butter in it. Once the butter is bubbling up a bit and threatening to brown on you, crack your 2 eggs into the pan. Sprinkle eggs with salt & pepper. Let these eggs cook until the white around them is getting more white/solidifying (about 1-2 minutes). Then carefully flip, so you don’t crack the yolk. Let cook another 30 sec – 1 minute. Once done, place eggs over salad. Drizzle with rest of mustard dressing over your magnificent creation. Mix all the above with either a whisk or place in small container with lid & shake about until emulsified. I hope you give this brunch & lunch salad a try! Lemme know how it turns out for you! 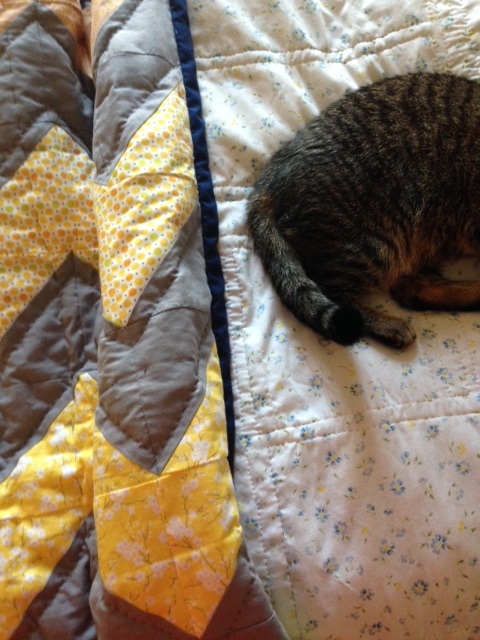 Your quilt looks amazing! great job! Someone is going to love it! You have expanded your blog to include recipes. How great! I definitely will try it b/c it sounds delicious and nutritious, except the bacon, Lol! Nice blog! and beautiful sunset picture! I can’t believe summer is over. Let’s talk soon! Love you!